Each volume is a trade-quality, soft cover book of approximately 200 pages, printed on acid-free paper, and includes illustrations, maps, and an index. Carroll Van West, PhD, served as the series editor. A legacy project of the Tennessee Civil War Sesquicentennial Commission, Tennessee in the Civil War received support from the Tennessee Civil War National Heritage Area. Explore the volumes below. THS members may download this PDF order form for major member discounts. An overview of the Civil War in the Volunteer State, from its causes to its legacies. 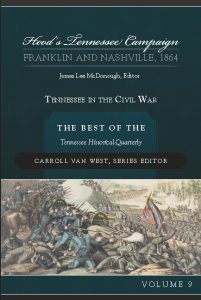 Tennessee in the Civil War, Volume 1, (12 articles, 222 pages, introduction, illustrations, index) overviews the entire wartime experience across the breadth of the Tennessee landscape, from battlefields to contraband camps, as it reviews the range of research and scholarship that brings these stories to the page. Memory, identity, emancipation, occupation, warfare, common soldiers – these are the themes of Tennessee in the Civil War. Focuses on all aspects of the war in East Tennessee. 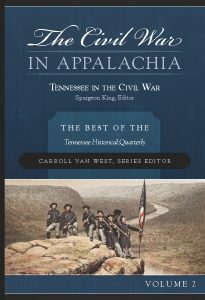 The Civil War in Appalachia, Volume 2, (10 articles, 230 pages, introduction, illustrations, index) looks at the divided loyalties of East Tennessee. Extensive regular army operations, guerilla activity, and an internal civil war of striking intensity and duration marked the region’s experience. Learn how and why East Tennessee’s Civil War developed as it did and how its consequences persisted for decades after the last gun fell silent. The best-known Tennessee battle, from eye-witness accounts to park preservation. 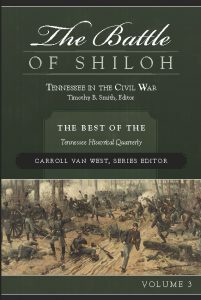 The Battle of Shiloh, Volume 3, (9 articles, 208 pages, introduction, maps, illustrations, index) examines Tennessee’s best known Civil War site, from eye-witness accounts to battlefield preservation. Shiloh historiography has changed dramatically over the years, and these articles reflect a variety of opinions on the actions that culminated in early April 1862. But the central narrative of each places the mystical story of Shiloh foremost. The battle at Murfreesboro, the Tullahoma Campaign, and more. 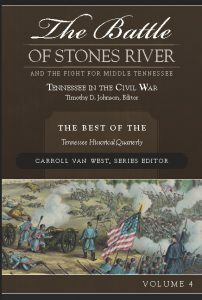 The Battle of Stones River and the Fight for Middle Tennessee, Volume 4, (9 articles, 208 pages, introduction, maps, illustrations, index) recounts the bloodiest battle of the war, when 81,000 men fought on the New Year, 1862-1863. Almost a third, 24,600 became casualties. Cavalry operations across Middle Tennessee, the Battle of Thompson Station, and the Tullahoma Campaign frame Stones River. And the legacy of the battles continues in the national cemetery, Fortress Rosecrans, and Stones River National Military Park. 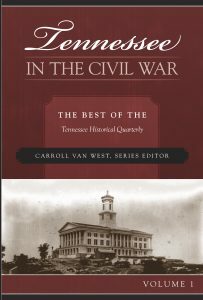 Looks at the controversial general, his officers, and the cavalry operations and battles in West Tennessee. 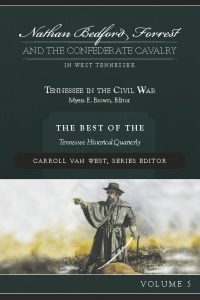 Nathan Bedford Forrest and the Confederate Cavalry in West Tennessee, Volume 5, (10 articles, 230 pages, introduction, maps, illustrations, index) focuses on Forrest’s strategic genius, military campaigns, and battles and those of his subordinates – Hylan Lyon, Frank C. Armstrong, and William Hicks Jackson — in West Tennessee, northern Mississippi, and western Kentucky. John Johnston provides the common soldier’s voice in his memoir. Explores the African American experience amid and following the turmoil of the Civil War. 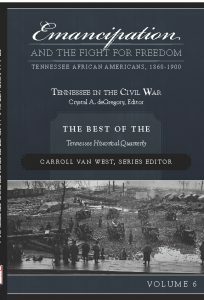 Emancipation and the Fight for Freedom: Tennessee African Americans, 1860-1900, Volume 6, (10 articles, 210 pages, introduction, illustrations, index) addresses African Americans during the Civil War and Reconstruction, examining themes of the Civil War, Reconstruction, and pre- and post-war education. The issue of slavery, at the epicenter of the Civil War, makes it imperative to discuss the sufferings, as well as the strivings, of African Americans in Tennessee during the war era. The campaign for Chattanooga and its rail lines, key to both Union and Confederate strategy in 1863. 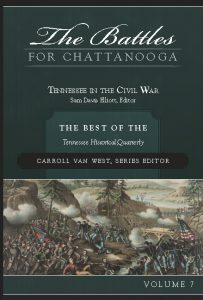 The Battles for Chattanooga, Volume 7, (11 articles, 198 pages, introduction, maps, illustrations, index) surveys the events leading up to the fight for Chattanooga, the effects of occupation, and the battles of 1863. Holding Chattanooga would help the Confederates retain East Tennessee and protect Atlanta, while with Union victory, Lincoln observed, “the rebellion must dwindle and die.” Fighting in the gaps of the Highland Rim and skirmishing in North Georgia led to bloody battles at Chickamauga, Lookout Mountain, and Missionary Ridge. Shares Tennessee women’s varied and dramatic encounters with the war and its stunning consequences wrought upon their lives. 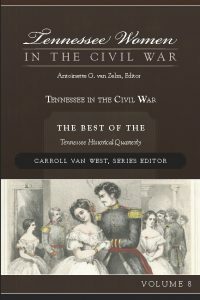 Tennessee Women in the Civil War, Volume 8, (11 articles, 200 pages, introduction, illustrations, index) shares Tennessee women’s varied and dramatic encounters with the war and its stunning consequences wrought upon their lives. Experiencing the cataclysm of the war firsthand, by war’s end they had witnessed and endured more death and destruction that they had ever imagined. After the war, they faced the work of reuniting their families, rebuilding their communities, and completing the transition from slavery to freedom. The final Tennessee campaign’s misery and mystery, ever after a subject of endless controversy. 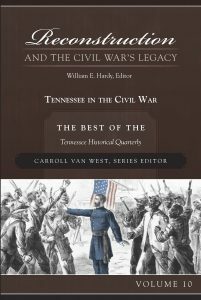 Hood’s Tennessee Campaign: Franklin and Nashville 1864 (10 articles, 202 pages, introduction, maps, illustrations, index) looks at John Bell Hood’s effort to save the Confederacy in the final, intriguing campaign into Middle Tennessee in late 1864. Highlighted by events at Spring Hill, Franklin, and Nashville, and characterized by misery and mystery, anger and turmoil, suffering, slaughter, and tragedy, Hood’s Campaign soon became, and ever after has remained, a subject of endless controversy. With a sense of tragedy and conflicted memory, Tennesseans struggle to restore the old order, or to build a new one. Reconstruction and the Civil War’s Legacy (12 articles, 226 pages, introduction, illustrations, index) surveys the aftermath of the Civil War. The mood of Tennesseans – black and white, Unionist and Rebel – became one of determination. Some determined to restore as much of their former world as they could as they rebuilt their devastated communities. Tennessee’s freed people, however, gloried in the slaveholders’ world turned upside down. Meanwhile, Unionists determined to keep former Confederates from regaining political power in the state. The legacy of the Civil War would shape Tennessee for decades to come.